Later this month, Joe Harris will debut as the new co-writer of The Fury of Firestorm: The Nuclear Men. Joe has an outstanding comics resume and we’re all very excited to see what direction he takes the book. In addition to writing our favorite hot-heads, Joe is developing a new creator-owned project entitled Great Pacific. He’s working with artist Martin Morazzo, editor Shawna Gore, graphic designer Sean Dove, and letterer Douglas Sherwood. Joe has put Great Pacific on Kickstarter to try and raise enough money to make this comic happen. This is where you come in. 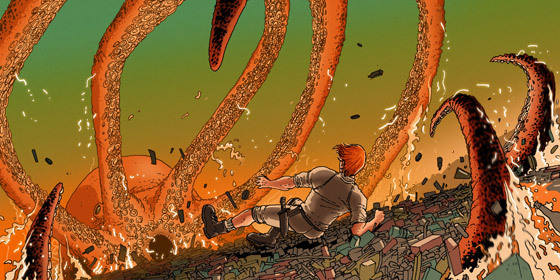 Please visit the Kickstarter site for Great Pacific and consider backing the project. When you visit the page, be sure to check out the video explaining the project. The video provides you with a glimpse of the fascinating story and breathtaking artwork. You can pledge as little as $5, or as much as you’d like. I’ve committed to back the project myself and I hope you’ll consider doing the same. They’ve only got a week left in the fundraising campaign and every bit helps. 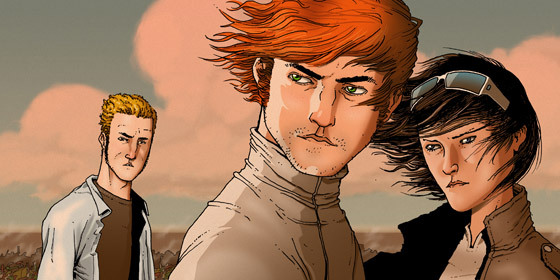 Great Pacific is a full-color sci-fi adventure comic book series set to debut in the US comics market in October 2012. This is an ongoing title, and this Kickstarter fundraiser is intended to cover creative costs for the first 132 gorgeously rendered pages (six issues). Great Pacific tells the story of Chas Worthington, recent heir to one of the richest oil fortunes and most successful corporations in American history. In a defiant act that seems crazy to most and criminal to many, he sheds his former life of wealth and influence to settle the infamous Great Pacific Garbage Patch, planting his flag and declaring the environmental wasteland a new, sovereign country. Set upon a floating island of plastic refuse and trash estimated by scientists to be twice the size of Texas, and based on the true-to-life environmental catastrophe currently plaguing the Pacific Ocean, this series will explore a young man’s attempt to tame this terrible new continent with the help of an astounding new technology that could change the face of the energy industry. But first he’ll have to contend with the elements, harmful pollutants, mutated marine life forms that have been exposed to the toxic refuse his nation is built upon, and hostile natives from nearby islands. Looming beyond those immediate physical dangers is the United States government, which sees him as a reckless and dangerous fugitive who needs to be dragged back to the ‘States using whatever means necessary. Sounds cool, doesn’t it! And the art is gorgeous! Be sure to visit the Kickstarter page and back this project today! Also, backers have access to some exclusive art from the series! Support Great Pacific! The Kickstarter deadline is next week! Support Firestorm (and Joe Harris)! Fan the flame! Great news! I hope Joe Harris is well prepared to write some tremendous good comic books. I’m very excited about this news. Thanks for sharing a wonderful article for firestorm fans.